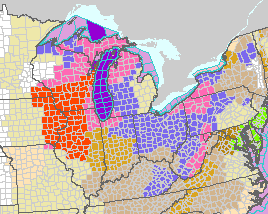 At the present time, the orange areas are blizzard warnings. Pink are winter storm warnings. Blue are winter weather advisories. Note the brown areas in the Appalachians and Potomac Valley. Very high winds are likely in that area including on the west side of the mountains where heavy snow is predicted to fall. AccuWeather has more on the wind threat. Since we don't do news coverage of the aftermath of winter storms (ABC, CNN, Fox, do that well) this will be the last forecast update. Tomorrow, I plan to post the final snowfall amounts as a followup. You can go back and compare the forecasts to what actually occurred. I think the forecasts will hold up very well.